Free-to-play game publisher Actoz Soft has announced the upcoming release of its newest mobile game, One for Eleven. The football (soccer) management game is coming soon to iOS and Android devices, and allows gamers to be the “manager [they’ve] always wanted to be.” The game will feature licensed athletes, a series of unique abilities and skills, with the ultimate goal being to create the best team possible to win the championship. 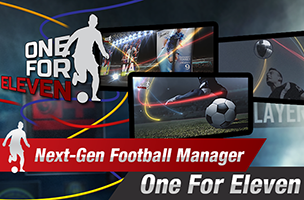 In One for Eleven, players will negotiate player contracts (and sometimes releases), and help their team grow via team formation, tactics, individual performance tracking, player substitutions and more. The game looks to support newcomers as well as seasoned management-title veterans by offering both broad and intricate management strategies. Included in this are 25 positions, 30 different abilities and 50 unique skills. One for Eleven will support games against other players from around the world, as well as cooperative social features. That is, players will be able to support their friends during matches, helping them achieve victory. Plus, gamers can recruit new players through tryouts, or trade their players with friends. One for Eleven will launch this Spring on iOS and Android. The game will launch will support for 25 languages. Check back soon to follow the game on AppData, our tracking platform for mobile and social apps and developers.